Farm Bulletin: 80 Mad Ave.
Summer Salad Smackdown: Celebrate the Sun! We're pretty old school around here. Both Dave and I grew up on opposite sides of the country but both with our noses buried in books—solving mysteries, flying in rocket ships, sailing the seven seas and generally living a much more exciting life than we found in our middle class homes and public school classrooms. Dave eventually became a newspaperman, working in a real old-fashioned newsroom, with typewriters clacking and telephones ringing and years of accumulated coffee stains and cigarette burns on the desks. And there was always a haze of smoke floating in the air from the cigarettes dangling from the reporters' lips. We actually met at a newspaper when I was in college and had a summer job in the ad department doing paste-up. Instead of going on dates he'd take me on reporting trips out to surrounding communities. When Mt. St. Helens exploded, we and droves of reporters rushed up to cover the story. Today we still get two newspapers every day, and a perfect Sunday morning requires nothing more than the Sunday papers and good strong coffee. 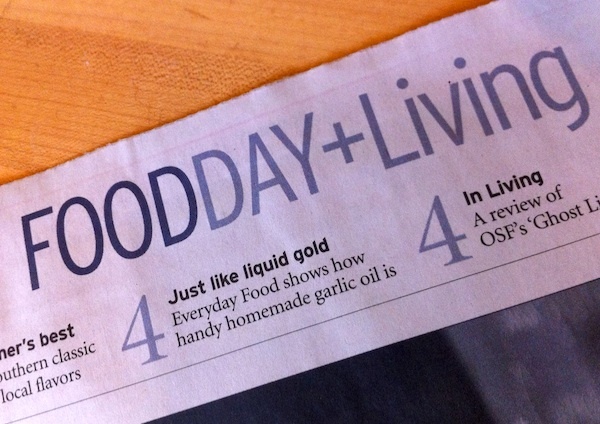 I love the special sections in the papers, especially FoodDay in Tuesday's Oregonian, which I've been fortunate to write for in my new-found career as a food writer. So I was surprised, shocked even, when I opened the Oregonian on Tuesday to find that FoodDay, instead of having it's own section, had been merged with that day's Living section. Instead of its usual six pages, it was down to fewer than four. And the usual Living features, the comics and the TV listings were simply tagged on to the end, a bizarre mash-up of both content and style. FoodDay's editor Katherine Miller, in response to an e-mail I sent expressing my condolences and questions, said "this change has been in the works for several months. FOODday is now four pages (once a month the fourth page will be the back of the section), instead of six. The move was part of the reorganization of the paper's features staff outlined last Sunday in an editorial by Executive Editor Peter Bhatia. This is also a move that many other newspapers have already made. In October I'll be attending the Association of Food Journalists conference in [Charleston, SC], where I'm sure I'll hear many similar stories." It's a sad development, especially at this moment when Portland's food culture and the bounty of the region is exploding on the national scene. So how can we stop the demise of such an important resource about local food? Subscribe to the paper, write the editor, and let them know that FoodDay is important. So glad to know I'm not the only one who is sad! That's really sad. FOODday is really fantastic - have found many of my favorite recipes there! And soon your Oregonian will come to you on a postcard. Having never heard of Charlotte, VA, I wondered if Miller meant Charlottesville, VA, or perhaps Charlotte, NC. The conference will actually be in Charleston, SC! Looks like you're right, Anon; will make a note of it!